For many Portlanders, retirement as they planned it has hit the wayside. Not because of poor financial planning, but because the task of raising their grandchildren has fallen unexpectedly on them. 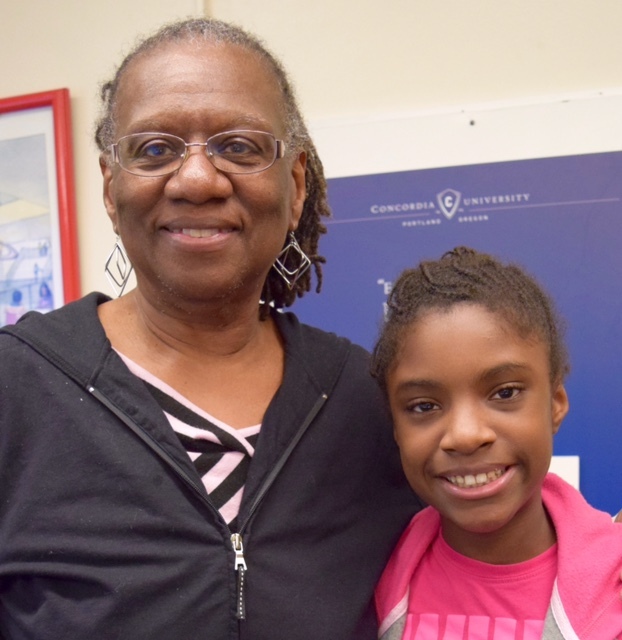 Jane Mayes, pictured here with her granddaughter, is a Ties that Bind navigator. Through the program Mayes offers support to other grandparents raising their grandchildren. Photo by Patience Tolentino. principal appeared understanding, but seemed to expect her to be able to cope with these issues. Fortunately, the principle recommended that Connie contact the Ties That Bind program to get some guidance. She was hesitant, however, to ask for help – ashamed that her daughter could abandon her own children, and embarrassed because she didn’t have the financial or emotional resources to handle the situation on her own. To protect the subjects’ privacy, the above story is a composite of several local families’ stories. But it could be your story, or that of a neighbor. Approximately 3,000 children in Portland live in multigenerational households without parents; Ties that Bind is working to address the needs of those affected. “The Ties That Bind support group is a resource for foster grandparents and family members raising grandchildren, and speaks to the quality of life issues our members face,” said Keren Brown Wilson, PhD. She is the president and founder of the Jessie F. Richardson Foundation, established as a non-profit in 1990 with a mission to work in resourceconstrained areas to provide multi-generational support to underserved older adults. The foundation is a sponsoring partner in Ties That Bind with Concordia University and Faubion School. One way Ties that Bind provides support services is via peer to peer navigators. The navigator, who is also raising children not his or her own, assists by inviting a newcomer to the support group that meets monthly, and can explain how to apply for food stamps, provide medical resource contact information, and recommend resources for dealing with behavioral problems. “The most valuable help comes from the support of knowing that we’re not alone,” said Pamela Harris. She and her husband, Ike, are peer navigators in Concordia. “Within the community grandparents of any age are suffering in the same manner and we all find comfort with others through the support group,” Pamela Harris said. Another avenue for support from Ties that Bind are meetings that provide a social outlet, resources, and expert referrals – and even offer child care. Meetings are generally held the third Tuesday of the month during the summer at 2 p.m. at Concordia University in the George White Library Room #120; in the winter months the group meets at Faubion School. Plans are in the works for a big family picnic at the end of August. Information about that event and additional information related to programs, resources, and peer to peer navigators is available by contacting Brown Wilson by calling (503) 408-4088 or email kwilson@jfrfoundation.org. JOIN US for our next TIES THAT BIND session! WHEN: Tuesday, July 19 at 2 p.m. – 4 p.m.
WHERE: Concordia University, George White Library, Room 120 Join our support and resource meeting for grandparents, foster grandparents and family members caring for grandchildren. You are not alone! Join a fellowship of grandparents where you can share and participate in conversation important to you! For additional information contact Keren Brown Wilson (503) 408-4088.